‎1078 nautical miles, one close encounter with a ferry, lots of whales, dolphins and seals, three thunderstorms, fog, great sailing, some motoring, wonderful sights, and 39 days living on the boat. That sums up the trip up the coast with our new boat, My Obsession. We have been home in PEI with the boat for a week now. 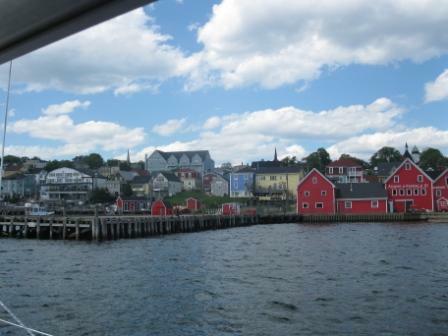 In our last blog, we were travelling overnight from Halifax to Port Hawkesbury. It was a magical night on the water. We arrived just after lunch in Port Hawkesbury and saw family that evening. It was a treat to stay at a marina for a night after all the nights at a mooring or anchor. The next day we passed through the Canso Canal Lock and into St George's Bay. About halfway across the Bay we were treated to an incredible sight, 30 or so whales and porpoises. It was amazing to see these sleek creatures of the sea. One minke whale passed about a boat length in front of us. I tried to take a few photos, but the batteries on my camera were low and I was too enraptured by the sight of them to go below for fresh batteries. About an hour later we found ourselves in a thunderstorm - the third one of our trip from New Jersey, but definitely not the worst. The rain was not heavy, nor was the wind strong, and visibility was at least a mile. However, one lightening bolt came uncomfortably close. My brother who came aboard in Halifax for the trip home swears he could have thrown a baseball and hit it, but I know it was more likely 3/4 of a mile away or so. Luckily, only the one strike was that close. The others were much further away. That afternoon we arrived in Ballantyne's Cove and enjoyed a visit with a friend. The next day was calling for patches of fog, so we got an early start. About an hour out of Ballantyne's Cove we were in a patch of fog that followed us the rest of the way to Souris, our home port this season. We saw nothing on the radar until we were almost in Souris. We arrived just as the ferry to the Magdalen Islands was leaving and we ended up directly in its path. We each sent off blasts of our fog horns and I made a quick course correction. Unfortunately, the ferry changes its course once it rounds the buoy and I had to make a second quick course corrrection to stay out of the way. I was very happy for the aid of the radar! Visibility was about 3/4 of a mile. Yet in a few minutes we entered the Souris Marina and there was no fog at all. In the week since we have been home we have only been able to take one short day sail with friends. However, we are already planning another cruise for August around the Maritimes, so stay tuned for more adventures. I can't wait! It's currently about 2300 hrs (or 11 pm for all you landlubbers). We are now 5 or 6 nautical miles off Ecum Secum, east of Halifax. The full moon is midway up the sky, off the starboard beam of the boat, having just risen out of a low-lying cloudbank on the horizon. The reflected light is shining off the water all the way to the horizon on one of the calmest seas I've ever seen out here on the Atlantic. Halifax has marked a milestone in this trip in a way I never expected. Being the first city we've visited since Portland, Maine, it was already noted in our minds as a logistical waypoint, and a natural spot to pull into for a couple of days to replenish supplies and visit with some friends. 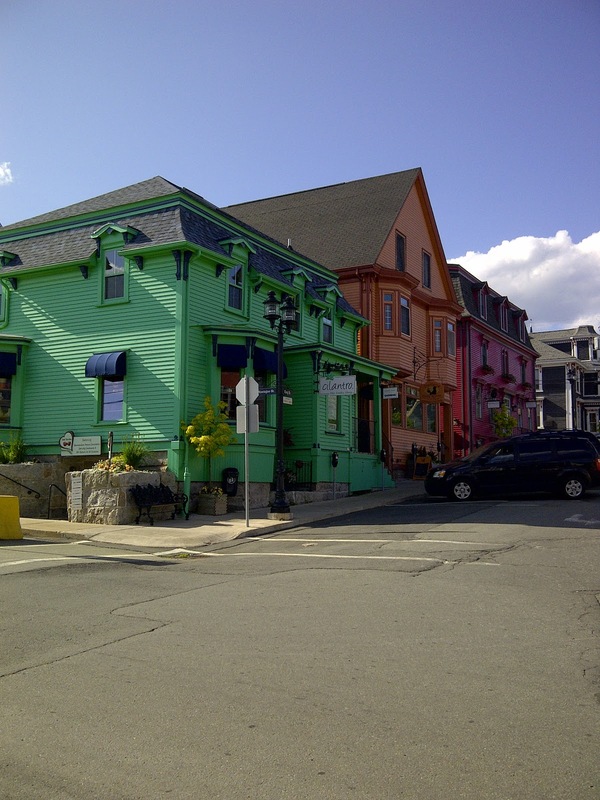 What was unexpected was the mental shift we experienced in reaching Halifax. For the first time in this trip, we were on familiar ground. Of course, normally we don't come into Halifax by water, so that was new and different. But now we were in a very comfortable environment. We had no real plans on how long we were going to stay in Halifax, with almost two weeks before having to be home again. But in the end we stayed six nights, more than either of us expected we would. Although we didn't really discuss it much, the layover just kind of lengthened into almost a week. We had reasons, of course, with friends to visit and weather that didn't really seem ideal for further voyaging. But, under the surface was the acknowledgement that the trip was entering a new phase, where getting home was just a few days away, and more importantly, the feeling was becoming more of a boat delivery and less of an adventure. When we finally knew it was time to leave, Michelle's brother Angus came to join us for the rest of the trip. We didn't have a definite destination in mind when we left Halifax. We simply planned to sail for a few hours, then pull into one of the numerous coves or harbours and anchor for the night. However, with three people now to share the load, we decided to go straight to Port Hawkesbury, a 180 nautical mile trip. So, now my shift on watch is ending in less than an hour. I'm sitting behind the wheel, where I can scan the horizon and enjoy the sight of the moon, now half-hidden behind a passing cloud. I check the chart plotter to ensure we're still on coure, and adjust the autopilot a degree or two if needed. A look at the radar confirms that we are the only boat out here. Then a couple sentences of typing, followed by a repeat of the whole routine. I'm certainly experiencing mixed feelings tonight, now that we have left Halifax behind and are on the way home, combined with the solitude of a night cruise. I sure hope we have many further adventures with My Obsession in the days and years to come, but I can't help but feel a little sad that this one has the end in sight. Today we managed to do something that can often be in short supply while cruising - we actually went sailing just for fun. We arrived in Halifax a couple of days ago and decided to stay for a few days. It was a chance to see friends and do a little bit of work. In fact, our time in Halifax is the longest we've been in any one port since Portland, Maine. This afternoon, we were planning on meeting a friend for lunch, but at the last minute it was postponed until tomorrow. We are meeting other friends for dinner later, but we had a few hours to ourselves. The sensible thing would be to get some work done, but it was a really nice day. So, we dropped our mooring and motored down and out of the Nothwest Arm. Once we were a little ways out, we shut off the engine and raised a sail. The wind is coming down the harbour right now at about 15 knots. It is hitting on our forward starboard quarter as we are about to enter the arm again. My Obsession is heeling slightly, casually channeling the breeze and propelling us forwards at 4 to 5 knots. We can see a collection of small school sailboats a mile or so off our starboard, going round and round, racing each other. A handful of other sailboats are also out on the water, taking advantage of the perfect conditions to play on the water. These days are all too rare when you are trying to get from place to place. Friday, July 8, 2011 is a milestone date for our new sailboat. This is the day that she shed an old name and gained a new one. The previous owners of the boat had christened her "Aquaries" - a reference to one of them having the astrological sign of Aquarius, and one having the sign Aries. This served her well while they owned her, but didn't apply to us. We have over the past few years grown attached to our "Obsession 305", even incorporating it into the name of our blog. So, we decided that we wanted to keep the "Obsession" reference in the new name. After considering multiple possibilities, consulting with friends and family, checking the Canadian ship registry, and even a debate or two amongst ourselves, we settled on the new name: My Obsession. However, when we picked up the boat in New Jersey, of course she had the old name across her hull, and we didn't want to take the time to put the new name on right away. However, while we took our two week break from sailing, we were referred to a couple in Chester, NS who do boat names and decals. We contacted them about updating the boat name while we were in the area. On Friday, July 8, we pulled into Stevens Boatyard in Chester, where we were met by Ray and Deborah and the new decals for our boat. Normally, they would be applying boat names while the boat was up on the hard during the off-season, but they agreed to rename our boat while she was in the water. It seems that applying the decals is much more difficult when the boat is rocking up and down, and trying to either drift away from you, or trying to pin you to the dock, however, they did a wonderful job, the result of which can be seen in the picture below. Thanks to the Sign Guy! Now, for anyone who has spent time on the seas, applying the new boat name is only half the job. It seems that Neptune, the King of the Oceans, dislikes anyone who disrespects a sailing vessel by trying to erase a name. No sailor wants to face the wrath of the Lord of the Deeps when they are far from land. So the only way to avoid bringing bad luck down upon you is to make an offering to the Sea. Now, as luck would have it, we had the perfect offering for Neptune. Last year, when my parents were South Carolina, they came upon a bottle of wine from a small, local winery called "Obsession". They thought it was perfect for us to enjoy on our boat, so they brought a bottle back for us. The problem is that Michelle didn't want to part with the bottle, so it remained unopened for over a year. Here was the perfect opportunity to break open the bottle of "Obsession", and use it to re-christen "My Obsession". So, after we moved off to our mooring for the night, we made our way up to the bow with the bottle of wine and two glasses. We poured a glass for each of us, asked Neptune for his blessing, toasted our newly named "My Obsession", took a drink, and poured the rest of the glass over the side as an offering to Neptune to grant his favour upon our voyages. I hope Neptune enjoyed his offering. It was actually a pretty good wine, and we enjoyed the rest of the bottle before making our way to shore to enjoy a good meal and an evening of theatre at the Chester Playhouse. One of my biggest concerns when crossing from Maine to Nova Scotia was the possibility of fog. How can you sail when you can't see where you are going? 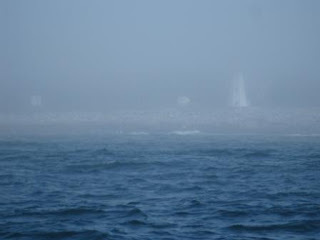 However, we had a clear passage across the Gulf of Maine with nary a wisp of fog. Yet, on this second leg of the trip we have seen little of the coast between Shelburne and Chester as the sothwestern shore of Nova Scotia has been shrouded in fog almost every day. We left Shelburne late in the morning on Wednesday as we waited for the fog to dissipate. However, Shelburne is quite far inland and though it had retreated from the town, it was lying in wait just offshore. It wasn't long before we were into the middle of it. The land disappeared behind a misty wall of gray as we set course for Port Mouton. Trusting in our radar and GPS/chartplotter, we set course and strained to see though the fog. Its thickness varied with sometimes as much as a mile of visibility, but more often about a quarter mile. Even those few times that we brushed near the coast, it was no more than a vague outline. 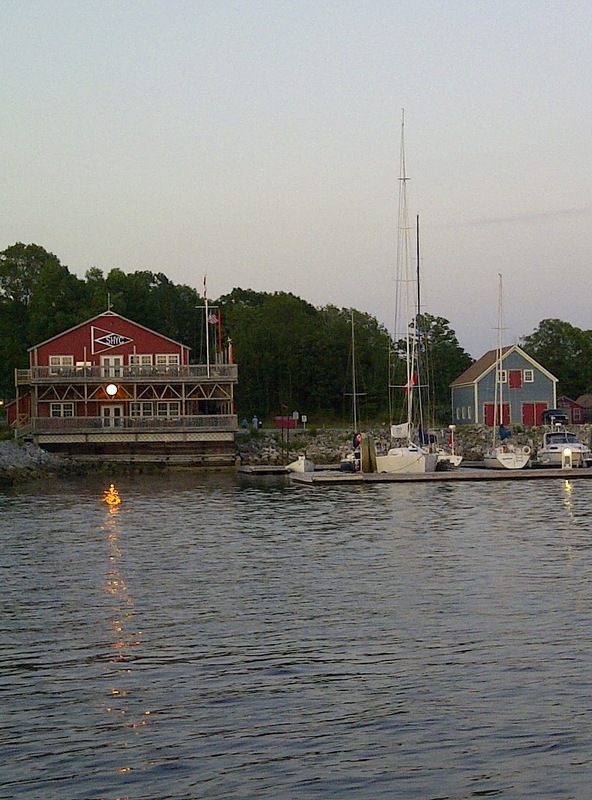 Because we had gotten a late start, it was after 7pm when we entered the bay of Port Mouton. Following the western channel between Port Mouton Island and the mainland the fog grew so thick it was as if we were slicing through it. The visibility was reduced to about 200 feet. Although it wasn't raining, as we passed through the fog, it condensed on the boat, leaving huge droplets of moisture. The narrow channel shallowed to about 15 feet, more than the 6 feet reported on the chart. Our trusty Garmin and C-Map guided us through and as we rounded Spectacle Island and approached Carters beach, the fog cleared enough so we could see the surrounding islands and shore. The water was about 40 feet deep, unless you went into about 100 feet offshore. Having lots of chain and rode, We stayed out further and dropped anchor. Due to the depth and the hard mud bottom, it took three tries before we were sure the anchor had set properly. Shortly after we had settled in, the fog came rushing back, obscuring the pretty beach. The next morning we lifted anchor about 8:30am and headed for historic Lunenburg. The sun was shining and the fog had receeded. Yet, as we left the bay, it was again lying in wait. At one point, we heard a horn and set off a blast from our own hailer before we were able to confirm it was a horn on a lighthouse and not a ship. What an eerie feeling to be so totally surrounded by a wall of fog that you feel completely adrift. As we entered Lunenburg Bay, the fog receeded and the sun thawed our chilled bodies. We could feel a warm breeze from the land. 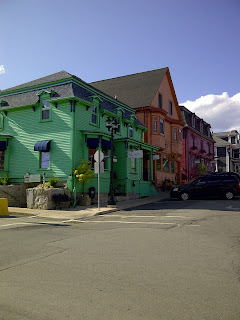 Lunenburg is such a pretty seaside town, its colourful buildings just can't help but bring a smile to your face. We took a mooring in Lunenburg Harbour and dinghyied to shore. We enjoyed the late afternoon wandering the small shops and returned to the boat for a beautiful sunset. The Bluenose II is currently in drydock undergoing a major refit, but the Picton Castle and several other ships were in harbour. Although we would have liked to linger in Lunenburg, we had an appointment to have the new name applied to the boat the following day in Chester so we left early the next morning for the short trip to Chester in beautiful Mahone Bay. Thankfully, the fog stayed further offshore and we enjoyed the beautiful coastline as we made our way in to Chester. For us, Shelburne has been a town full of the unexpected. 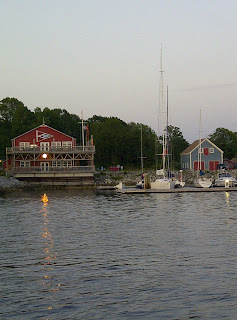 It's been two weeks since we pulled into Shelburne after our overnight crossing of the Gulf of Maine. Very reluctantly, we had to leave our new boat on a mooring at the Shelburne Harbour Yacht Club. We had committed to give geocaching seminars for the Lighthouse Festival back in PEI over two weekends. Although it was a great opportunity for exposure for our store (www.turretbell.com - yes, this is a shameless plug), we would have jumped at the chance to stay on the boat and continue our adventure. However, since we had decided to make the boat delivery into an adventure, we knew we would have to break it up at this point. Both weekends of the festival went very well, and we came back to Shelburne the very next day. Now, Shelburne had been recommended as the port of entry by our broker two weeks ago. Although there was a bit a mixup with paperwork being sent to the wrong office, our clearance into Canada went very smoothly. As we were nearing Shelburne, and were finally able to connect to Canadian cell towers once again, we both posted on facebook where we were. Almost immediately, I got a return message from my cousin Patsy, who lives in Shelburne. Since it is difficult to make any advance plans when sailing on a trip like this, we hadn't contacted anyone in advance, and had no expectations to meet up with anyone. We had a great lunch with her and her husband. But the visitations sure didn't stop there. A couple hours later, we were relaxing on the boat and taking a short nap after the all-night crossing when we heard a knock. Another cousin, Lisa, had come by to visit. We sat on the boat for a couple of hours with her and her partner. This was followed shortly by a visit from my uncle Pat and wife Mary. It was a rare treat to get to spend time with them. Michelle's parents had met up with us earlier in the afternoon, as they were driving us home the next day. They came back to the marina in the evening, and we met them in the parking lot as Pat and Mary were leaving. They had come down with their truck camper and were staying the night. Suddenly, we see two people walking across the parking lot towards us. It took a couple of seconds to realize that it was Clive and Marnie from PEI. They also were camping with a truck camper, just happened to be in Shelburne at the same time, and thought they would come over to look at the camper they saw. They were just as surprised to run into us as we were to see them. An expected quiet day and evening in Shelburne turned into a full day of visits and reunions. Now, we are back in Shelburne. When we arrived last night, we had to restock the boat with groceries, so we went up to the local grocery store. We were getting ready to leave when Michelle realized she had forgotten something, so she ran back in. She was no more than a few paces inside the door when she heard her name being called. She turned around to see Cheryl, an old friendwhom we had not talked to in awhile. Cheryl has a special status for us, as she is the person who introduced Michelle and me all those years ago. We didn't even know she had moved to Shelburne, and we were astonished to run into her. We chatted for awhile and caught up in the parking lot before she had to leave, but it was wonderful to again see an old friend. It has been a busy couple of weeks, so we decided to stay another night and have a quiet day. After spending the afternoon reading and catching up on some sleep, we went for a walk through the town. This is when we stumbled up another surprise - Charlotte Lane. This is a restaurant and craft shop that we first visited about 17 years ago, just after they opened (www.charlottelane.ca). We were living on Ottawa at the time, and happened upon the restaurant by chance. The food was delicious. However, as time passed, we only remembered that great little restaurant down on the South Shore, and couldn't even remember which town it was in. Five years ago, we took a drive down the South Shore. For the second time, we stumbled upon the same little restaurant that we remembered so fondly. And the second time around, the food was just as good. Now, my memory is just as strong, and we had forgotten where the restaurant was again. In fact, I thought that it was in Lockporte, just up the coast from here. During our strolls today, guess what we find? The same wonderful restauant. We immediately made reservations again, even though we weren't planning on eating out tonight. The food was just as fabulous as it had been five years ago and 17 years ago. We are planning to leave tomorrow to continue our cruise back home, but our time in Shelburne has definitely been filled with the unexpected. Perhaps now, I'll even be able to remember the town where that great little restaurant is next time.